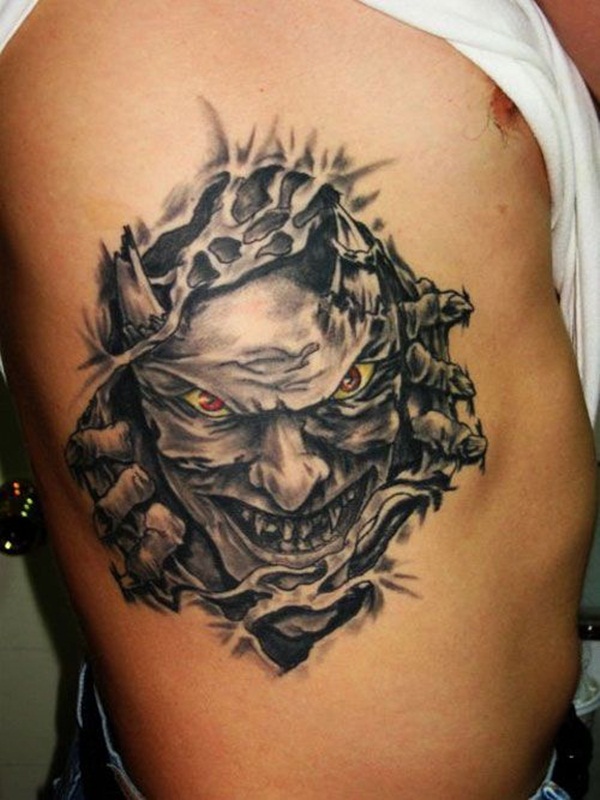 Yes, there is a type of tattoo design that makes it look as if your skin has been ripped apart with various worlds exposed or creatures attempting to break free from the realms of your very body. 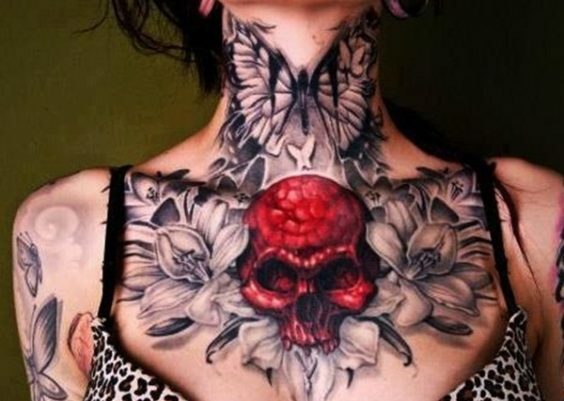 The world of tattoos ranges from the simplest to the most bizarre of design possibilities, with many choosing to display something ripping apart their flesh as a permanent inked choice of art. 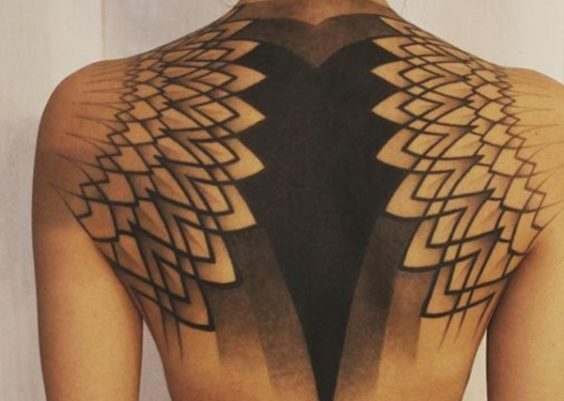 The imagination has no limits, and neither do these 39 ripped skin tattoos Creem has compiled for your viewing pleasure. This guy has ripped skin tatted exposing various beautiful patterns. Wonder what they’re supposed to be symbolic of? 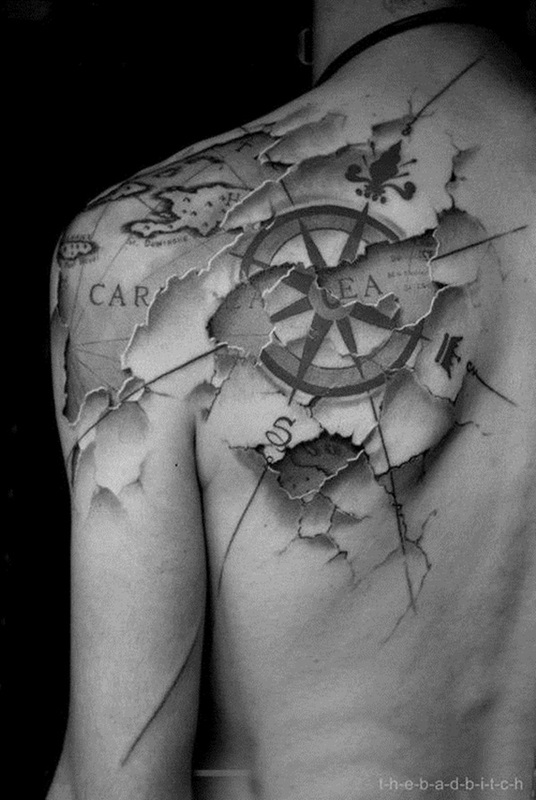 This is a truly creative and beautifully done tattoo, making the skin look like old paper worn down exposing both a compass and a map underneath. 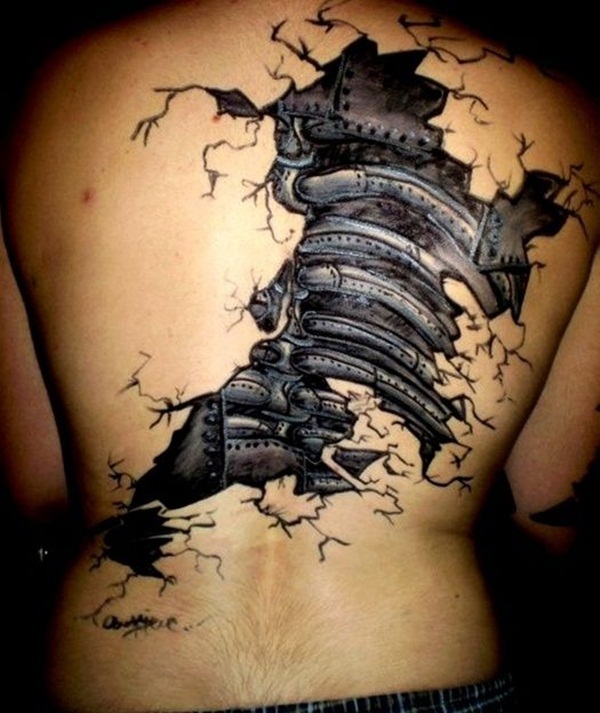 A piece of body art like this is perfect for those that enjoy pirates, the open seas, or boating in general. 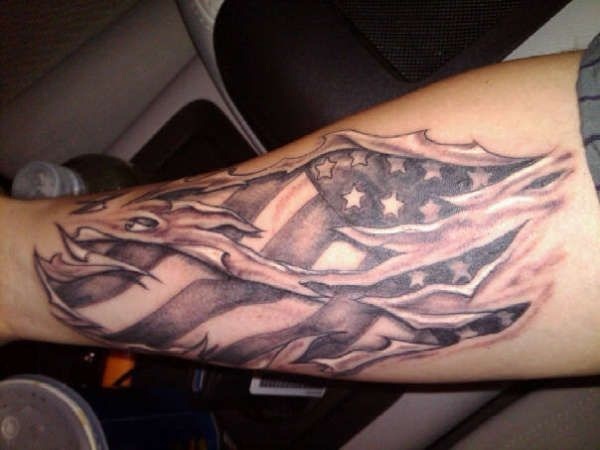 As if wearing a patriotic flag-like shirt wasn’t enough, some people enjoy wearing around their Patriotism permanently on their skin. This one look like it could use a little color. Behind everyone’s false persona is a need to break free. 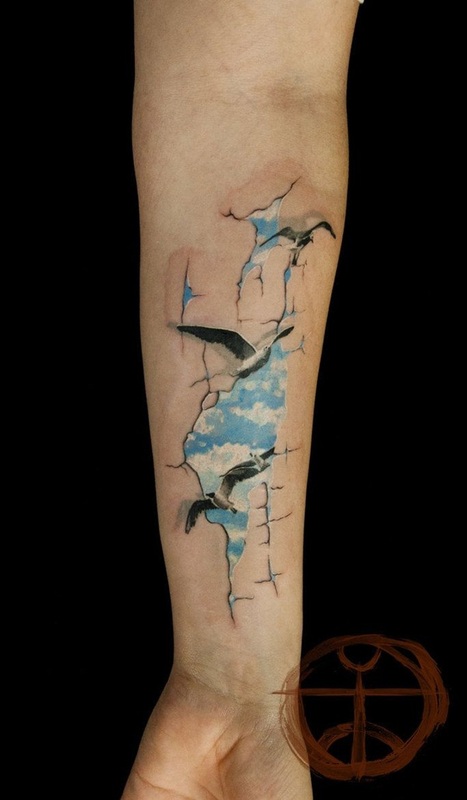 This tattoo display the freedom the wearer values, birds representing freedom through flight; the ability to go wherever they please. The sky is endless, just like this person’s dreams. 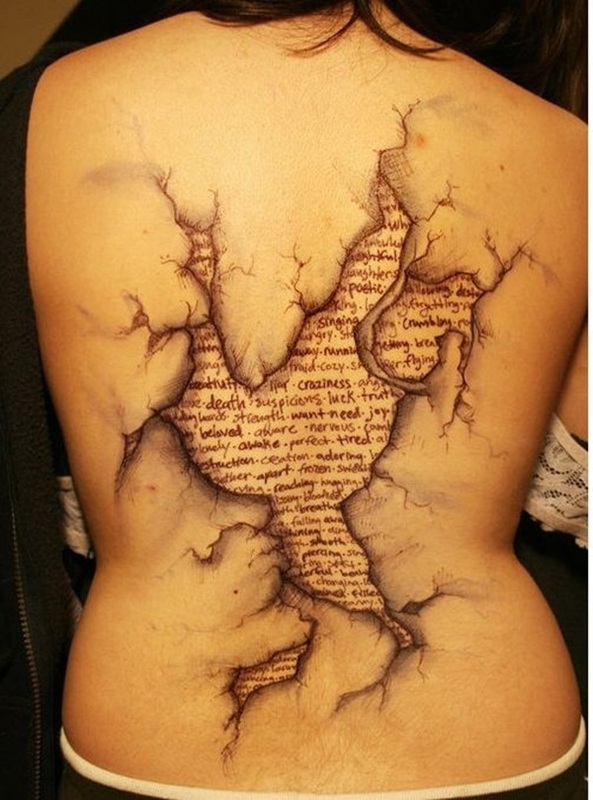 This person’s flesh looks as if underneath is displayed a religious text. While its kind of hard to tell what it says, it truly could say anything. 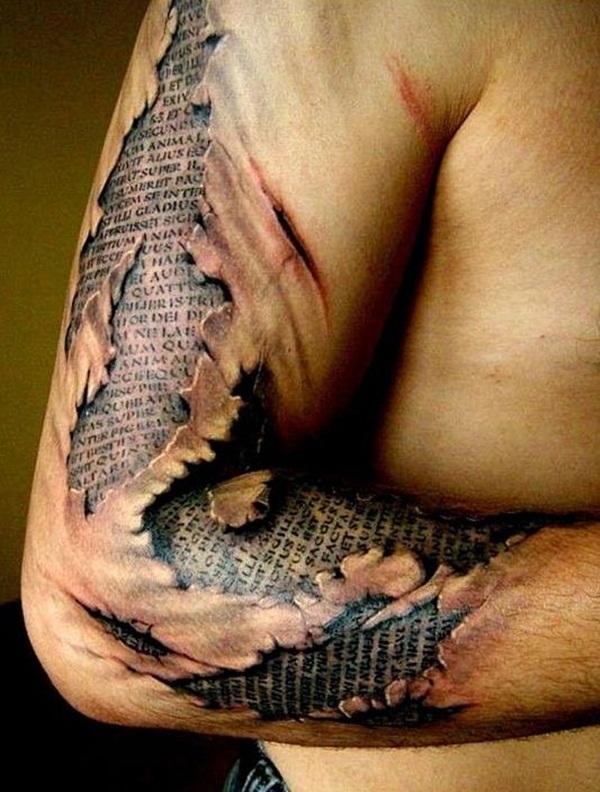 Getting a ripped skin tattoo can display nearly anything underneath, including any text from any book you admire or has made an impact on your life personally. 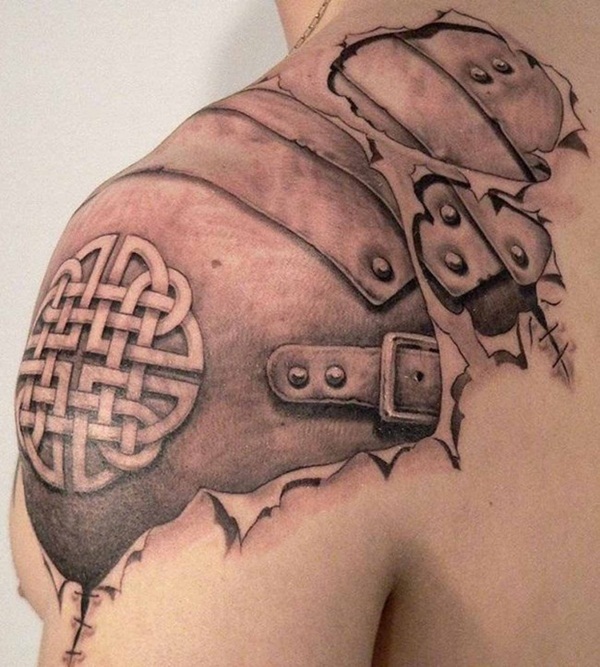 The world is exposed here in this tattoo beneath the wearer’s skin. 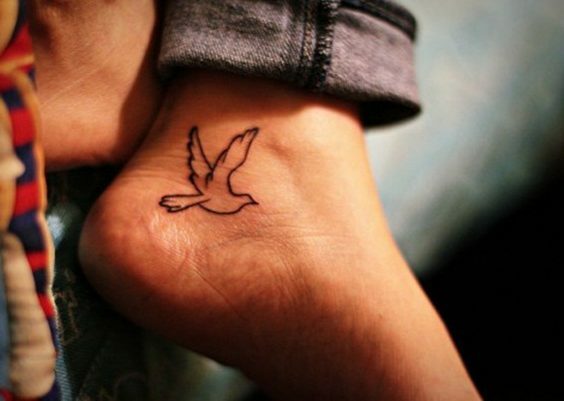 Along with it are symbols that truly mean something and are significant to the person that received this tattoo. 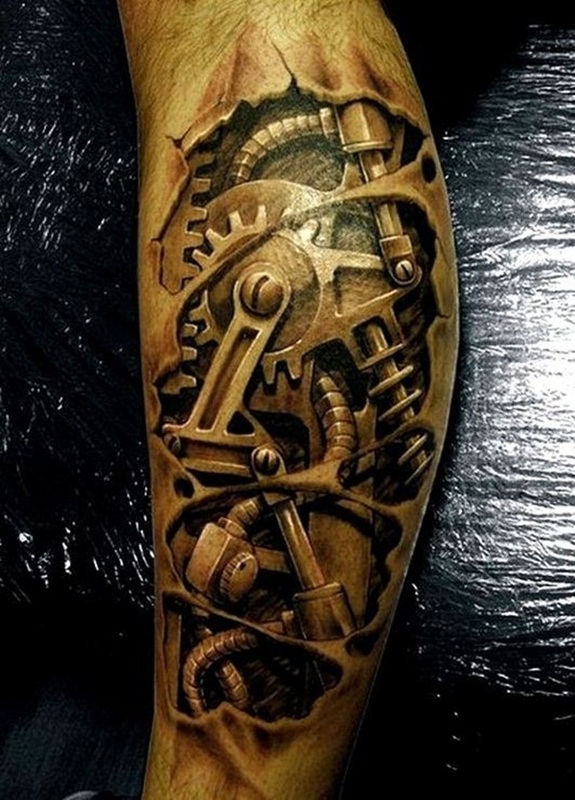 You can get basically anything you want displayed beneath your skin. What means something to you? What comprises of your being? Ever hear how some people like to associate with an animal, saying they’re as fierce as a tiger? 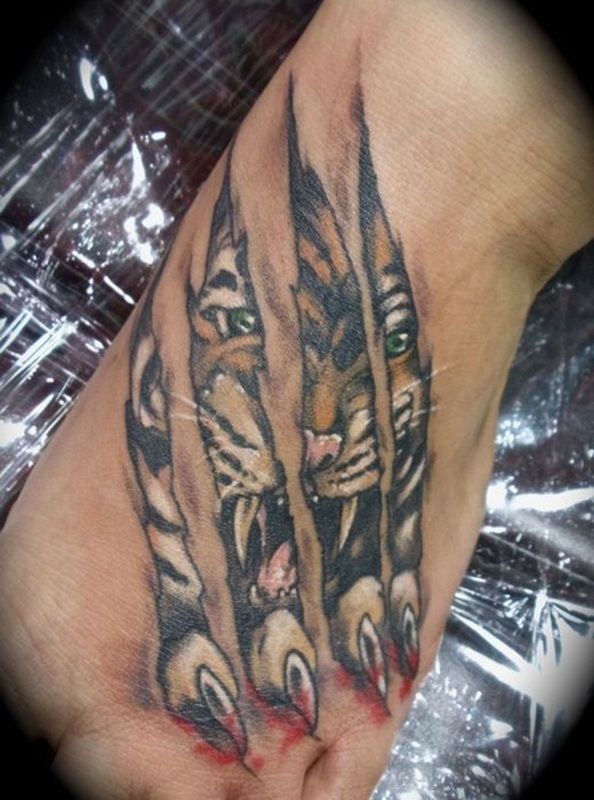 This tattoo expresses how the tiger is within them, symbolically attempting to get out and destroying itself in the process. Unfortunately, the one above looks a bit lopsided. 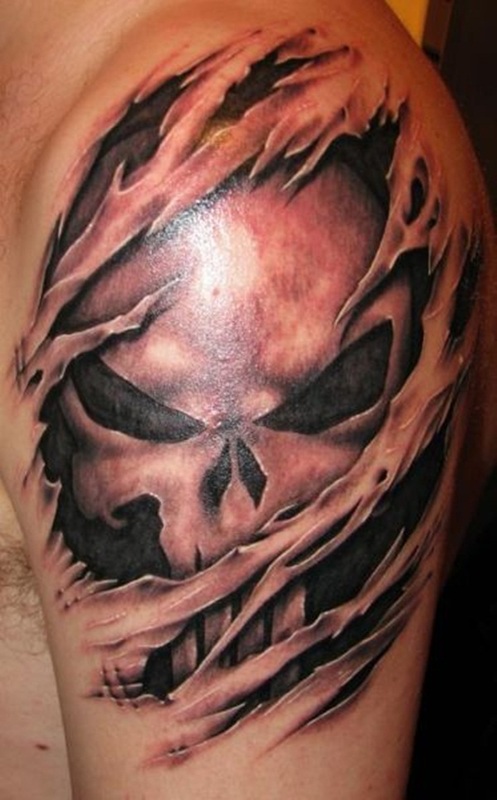 Yes, that’s the skull from the infamous comic and movie The Punisher. Some people enjoy having their favorite movie symbols tatted permanently on their skin, associating a character with their own personality. Yikes! This guy was in some kind of epic fight that required stitches and whoever did the stitches did a horrible job! 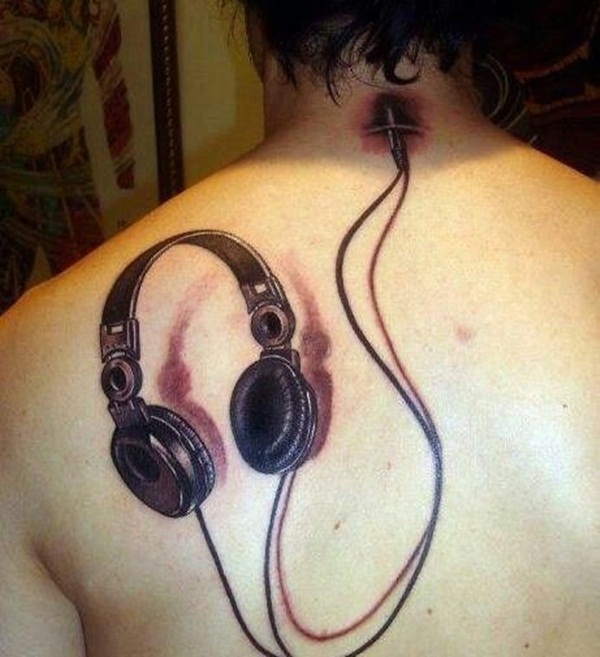 Oh wait, it’s just a tattoo. Well, that’s a relief. 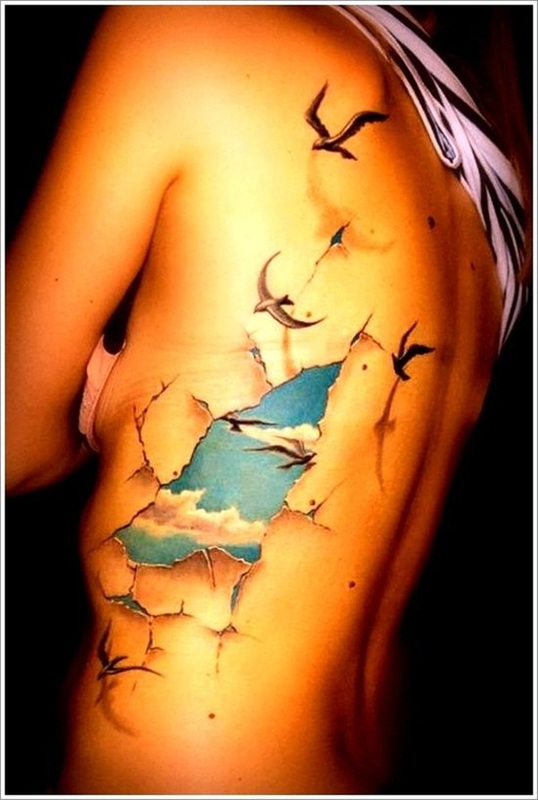 Another lovely and inspirational tattoo of the freedom of the sky and birds living within the realms of this person’s body. 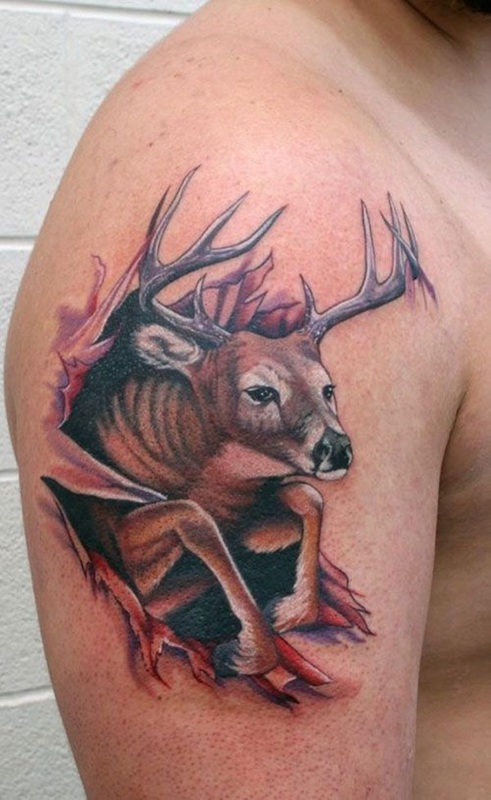 This must be a hunter’s dream tattoo, we can’t imagine too many people having a deer jump out of their flesh in such a bloody manner. Beneath this guy’s skin is some kind of symbol we’re currently unfamiliar with along with even more cracking of whatever design it is. Creative yet confusing. Leave a comment below if you know what this means. Wonder how this guy’s partner feels about this creepy face peering at them whenever he takes his shirt off… Some people actual want to display a creative character ripping themselves through their flesh. Sometimes, it could be a haunting image such as the one above, sometimes, it could be something quite different. 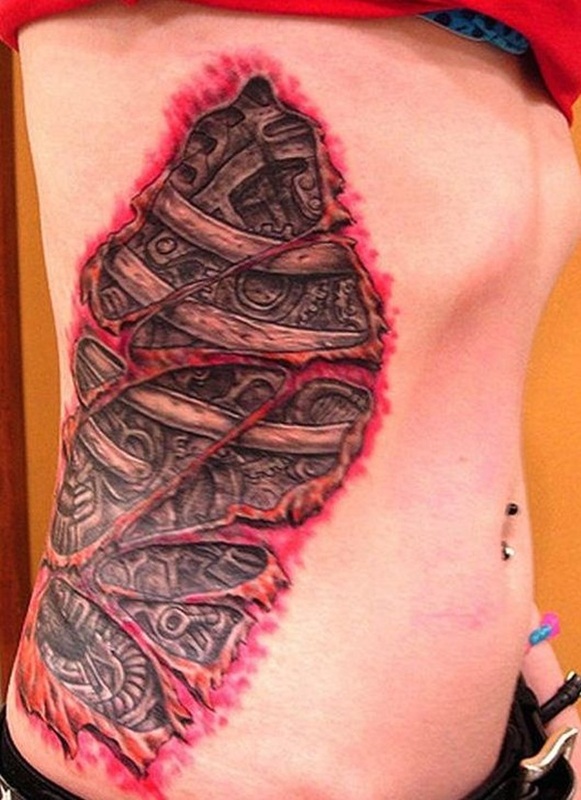 Not every ripped flesh tattoo displays the grotesque nature of the inner bloody anatomy. 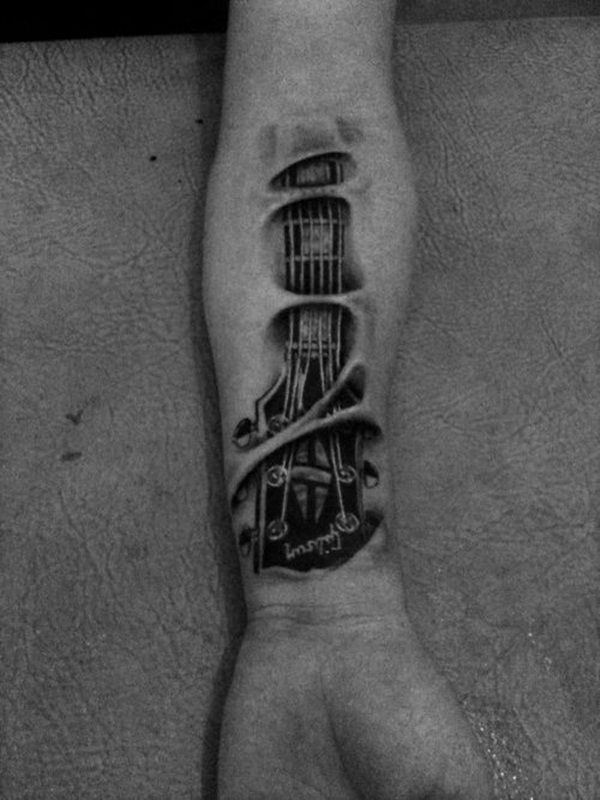 Some tattoo wearers become more creative and add just a touch of futuristic nature to their body art such as seen in the tattoo above. Half robot, half man… a cyborg? 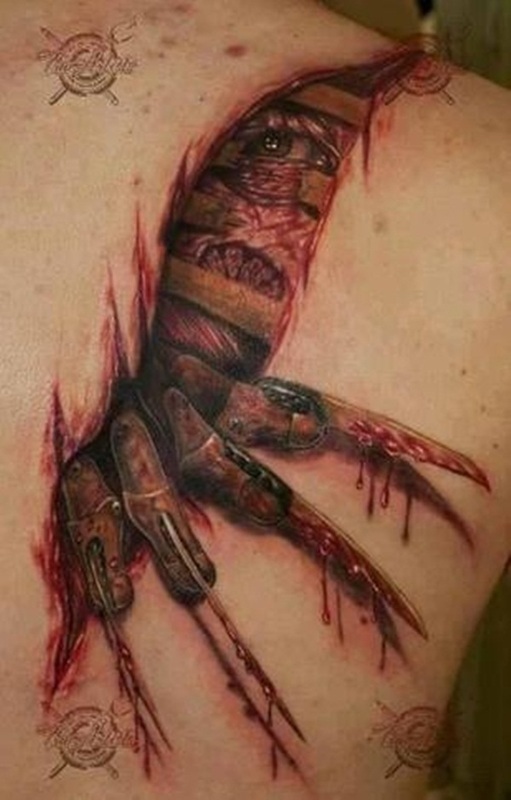 First of all, this one is a creepy tat. But you have to admit, the detail in the eye makes it look entirely realistic as well as the torn flesh surrounding it. Well done work, just super crazy creepy! 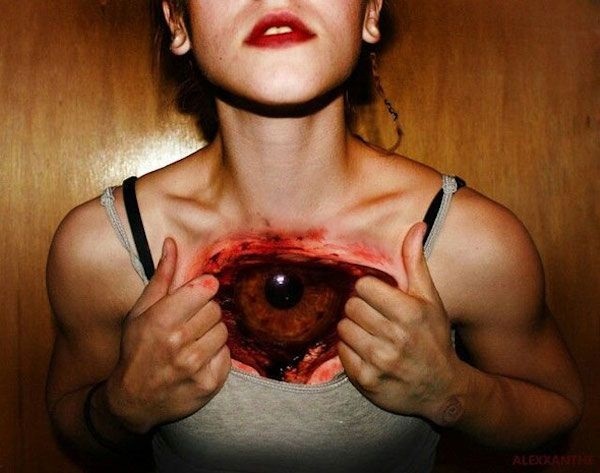 Still, props to the artist that’s mastered the inner flesh’s eye. What more can we say? 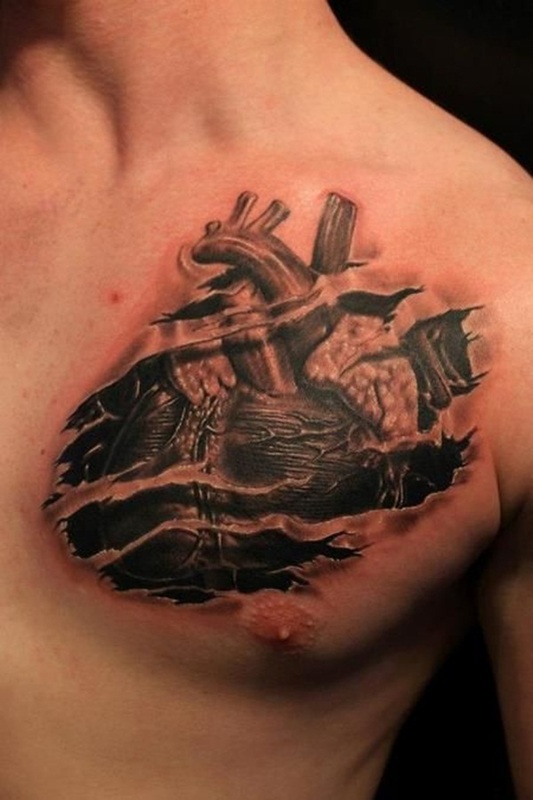 This is a classic ripped piece of flesh art displaying both bone and muscle. We’re a fan of ripped flesh looking like maps such as in the image above, and its accompanied with a lovely looking compass. 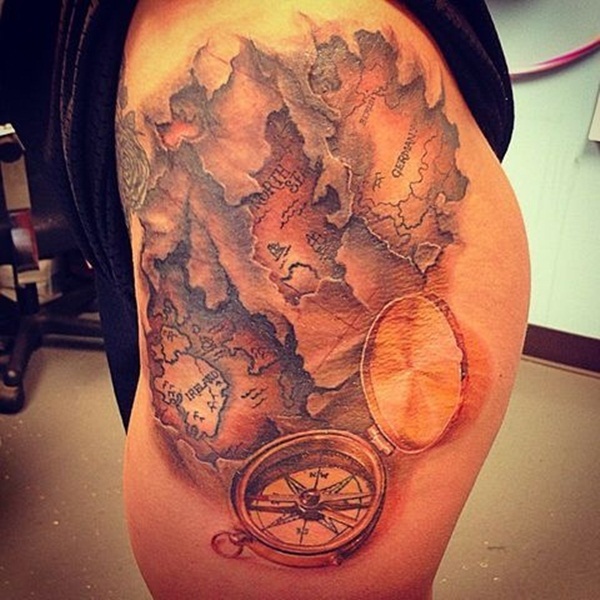 Tattoos like this are perfect for those of us that enjoy traveling and feel as if its a part of us; as if seeing the world is truly what keeps our clocks ticking. Ever feel as if you’re actually some kind of fae creature that’s made out of leaves, sticks, and stones? No? Maybe? This girl apparently does. 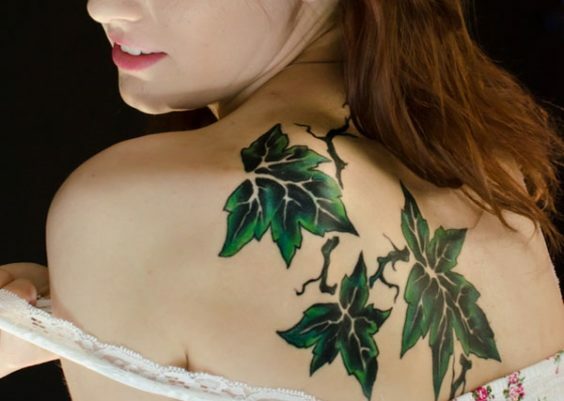 It looks as if a forest is thriving beneath her skin, awaiting to rip free. 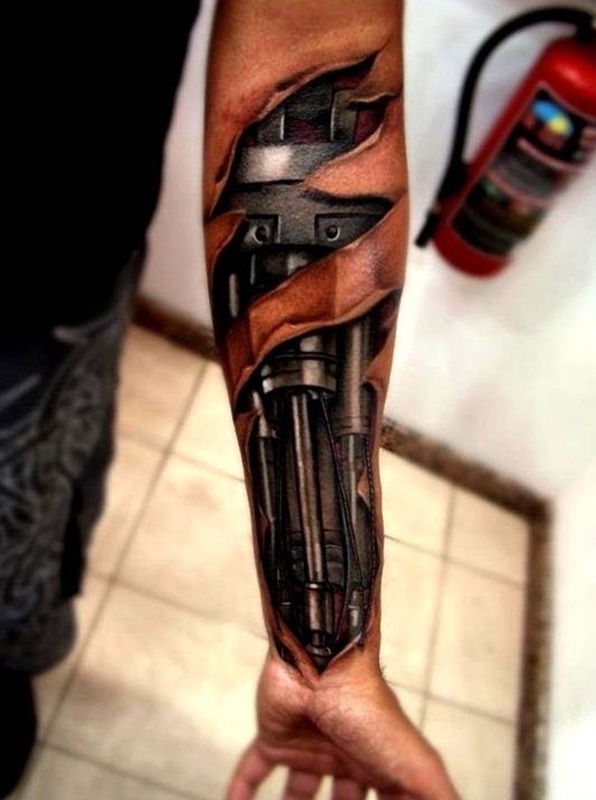 This tattoo is absolutely stunning, with realistic robotic workings tatted onto this guy’s arm. Ever see “I, Robot” where Will Smith had a robotic arm? Yeah, that’s what this is like, except there is much credit to be given to the real artist here – it isn’t digitally mastered. 20. Poetic Justice or Injustice? 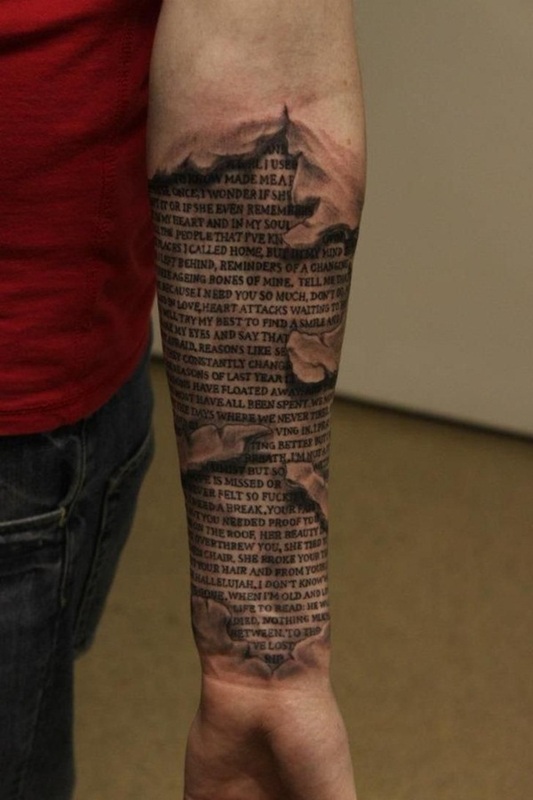 If you get a ripped flesh tattoo that displays tons of words; an entire text, you have to ask yourself: Do I want people to stare at my arm as they attempt to read the wording inked on my arm? 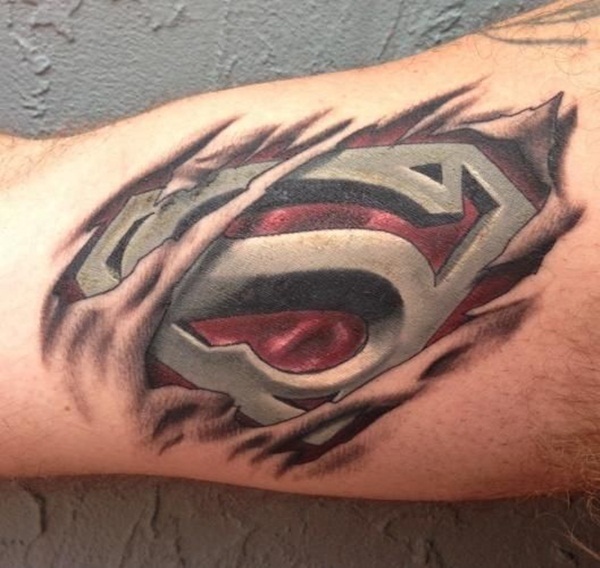 I don’t know about you, but I’d be annoyed by too many onlookers getting a glance at my tat. Some of us adore fantasy, and what better way to show it than to pretend we’re truly a mermaid underneath it all? 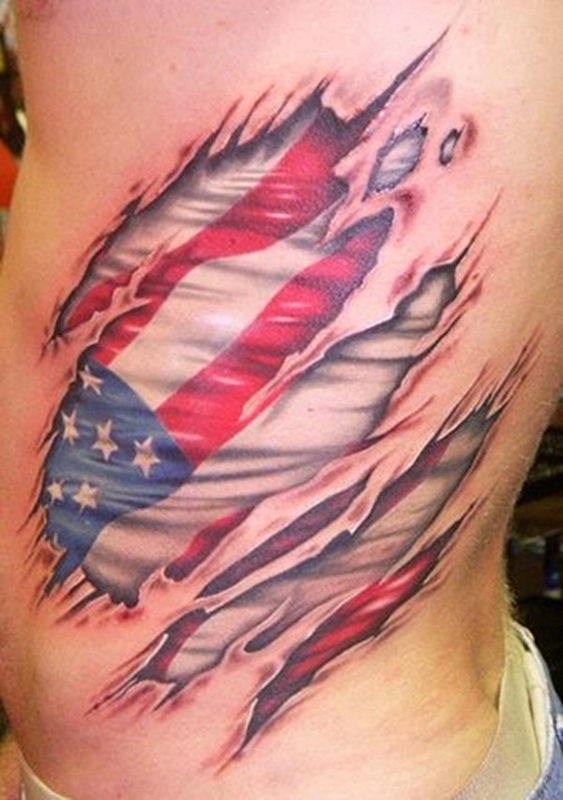 Another classic tattoo of a flag displayed behind ripped flesh. 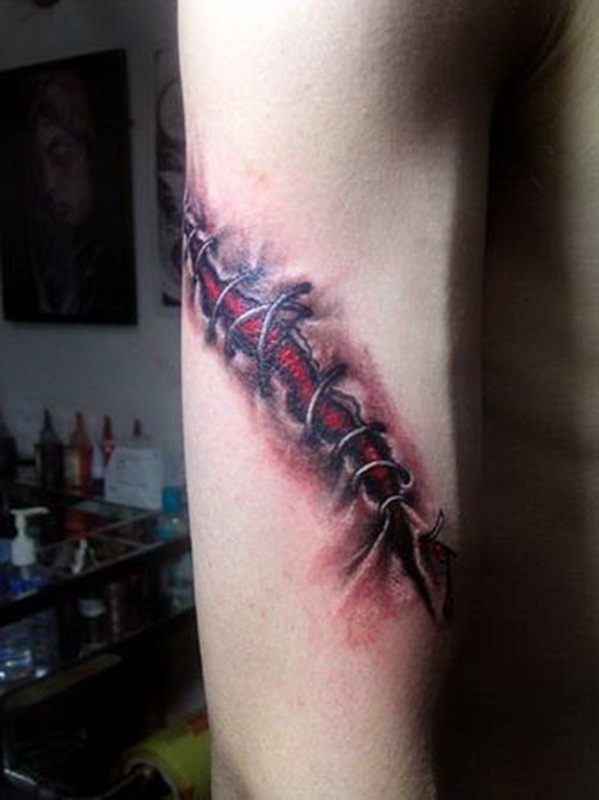 This tattoo is symbolic as well as literal. The star represents that which shines in one’s life, and beneath the star within the wearer’s flesh, is listed all that means something to the wearer. We are made out of what we value. What do we hold dear to ourselves? 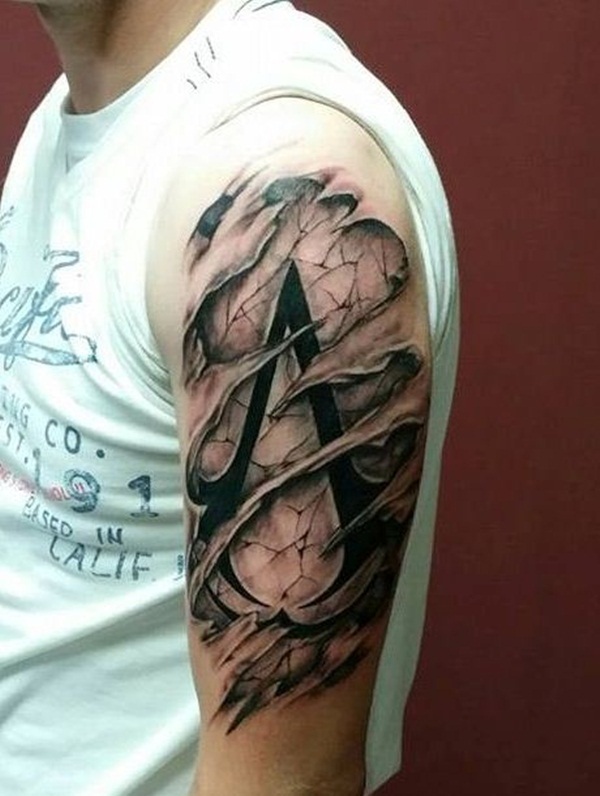 Seems like that’s what makes to most sense in a tattoo. 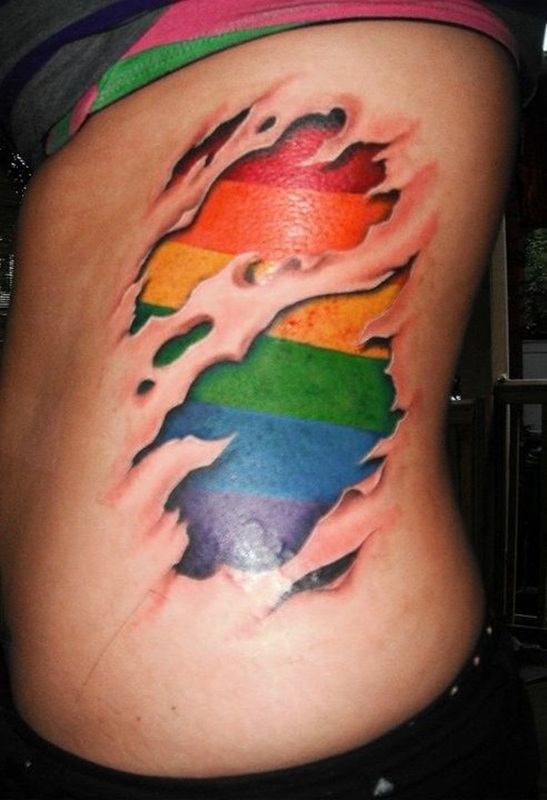 A lovely tattoo that represents equality for all. 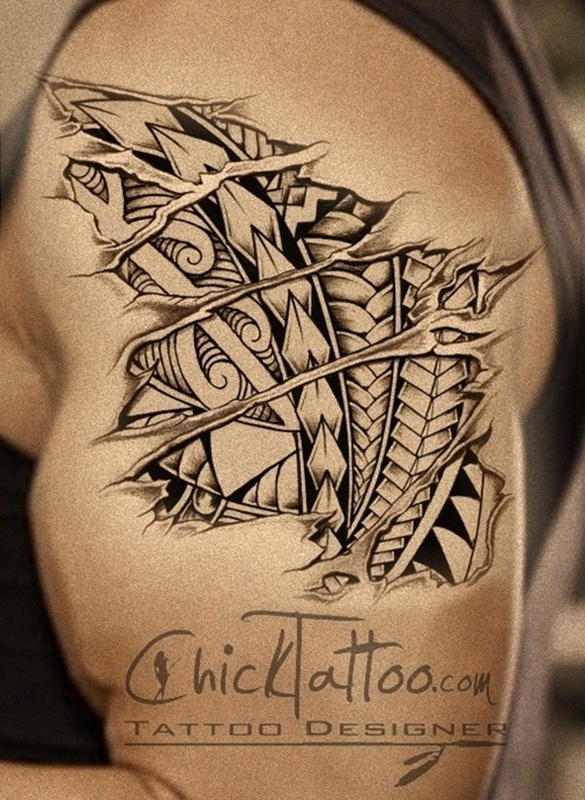 Sometimes we want a tattoo to display something we truly believe in; we idealize; we fight for. Unfortunately this person has far too many gears in their abdomen, so it would seem. Hate to say it, but kind of looks as if an amateur did this. Might need some touch ups. 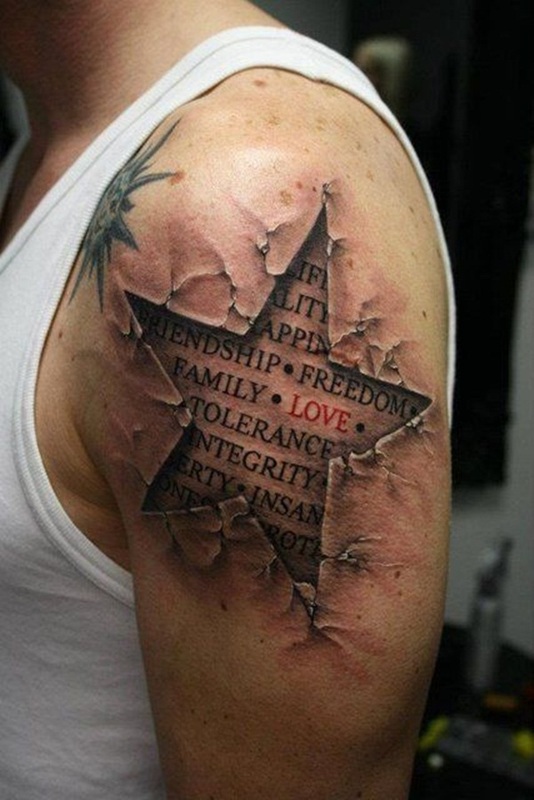 You can get pretty creative with what comes out or what goes into your flesh when it comes to these types of tattoos. This one is far less gruesome, yes? Wow! This girl made her own flesh look like a corset! Props for creativity. She’s actually a robot. Instead of making her flesh look bloody and gross surrounding the edges of the corset, she actually placed flowers instead. Lovely. Sometimes, we want to be the hero we grew up with as a kid. Looks like this guy has some delicate flesh about to unravel, with some stitches that are coming undone. Again, we see there is text beneath his flesh. Does any o fit actually make sense? Instead of a fleshy mess or robot machinery, this guy got creative. 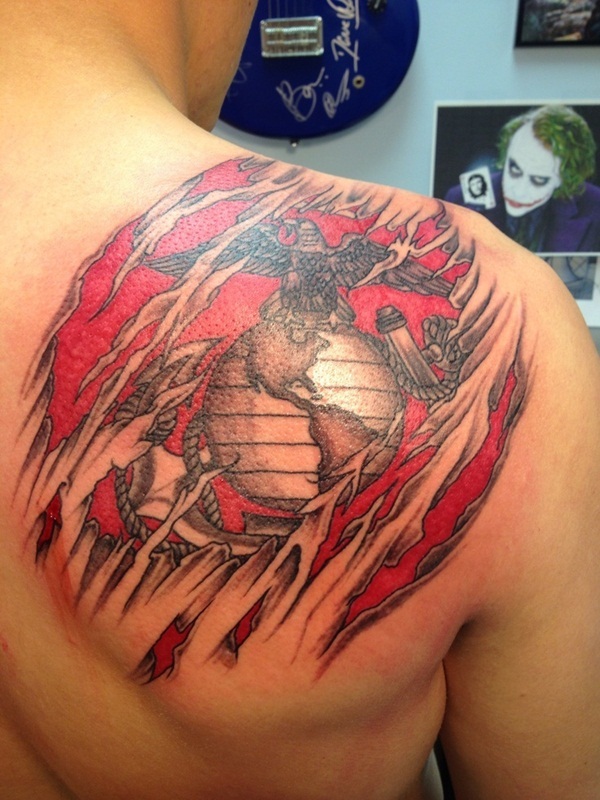 He has a warrior’s armor showing beneath his skin, and it portrays great symbolism associated with his personality. He’s a fighter, and enjoys the fruits of victory. Are you a fan of “Nightmare on Elm Street”? Because this guy definitely is. I can’t imagine many people wanting to carry around Freddie forever on their back – the murderous stalker that kills people in their dreams. But hey, to each their own. The details look amazing, I have to admit! 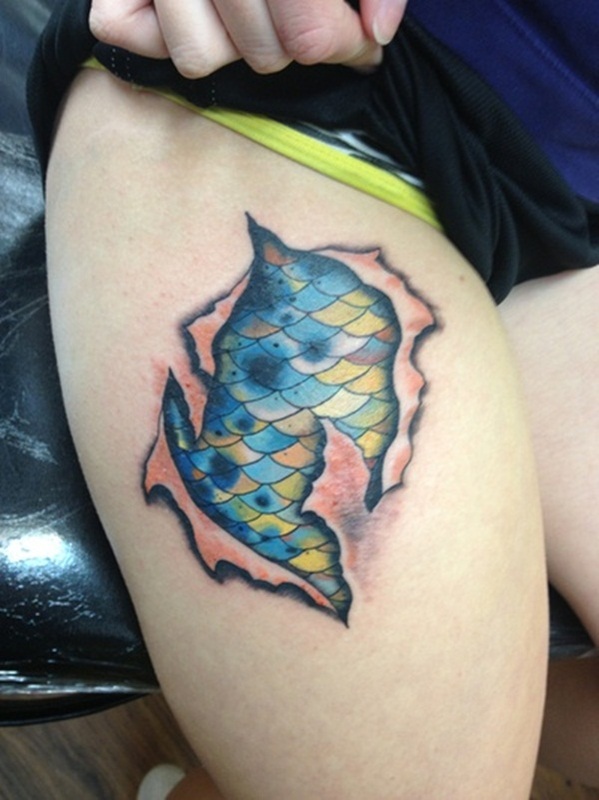 This tattoo has a little bit of gross mixed with a little bit of cute. 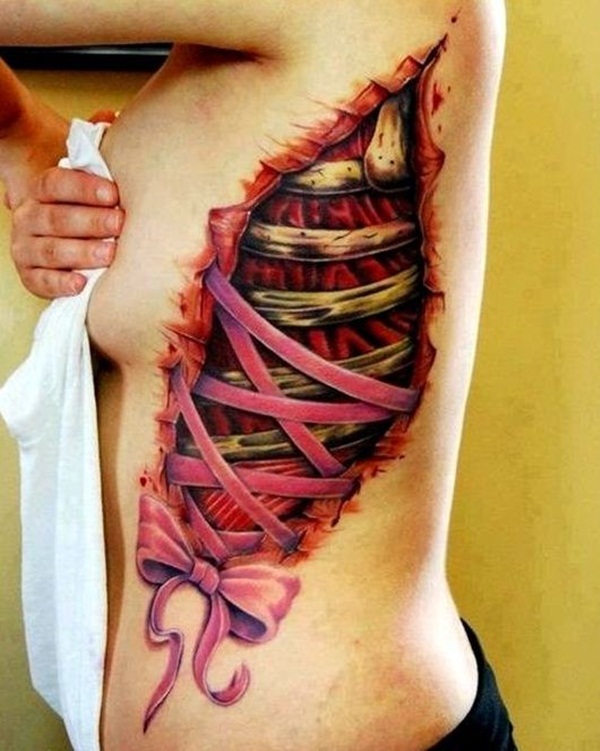 What girl wouldn’t want their torn flesh displaying all their muscles stitched up with a thick pink bow? Yikes. If you’re in love with music, specifically guitars and know how to play them, this design makes for a great way to tribute your favorite tunes to the world – displaying that which motivates you and inspires you. If you’re familiar with how gears and pulls work, you may be asking yourself, what the heck all those gears are doing in calf. Really, this is definitely just eye candy and doesn’t really serve a purpose (of course, tattoos can be anything, we’re just saying…). And of course there are those of us that enjoy our favorite comics. 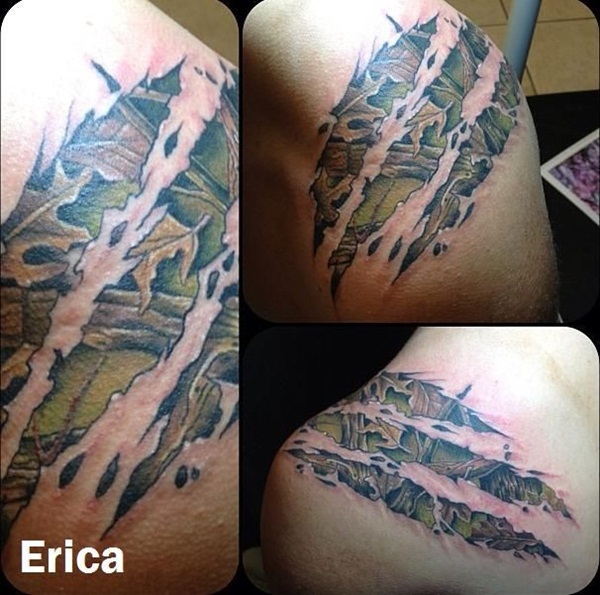 Why not tribute an awesome tat to them such as here: XMen? This looks more like a diary entry, with lettering that’s realistic and not a font. 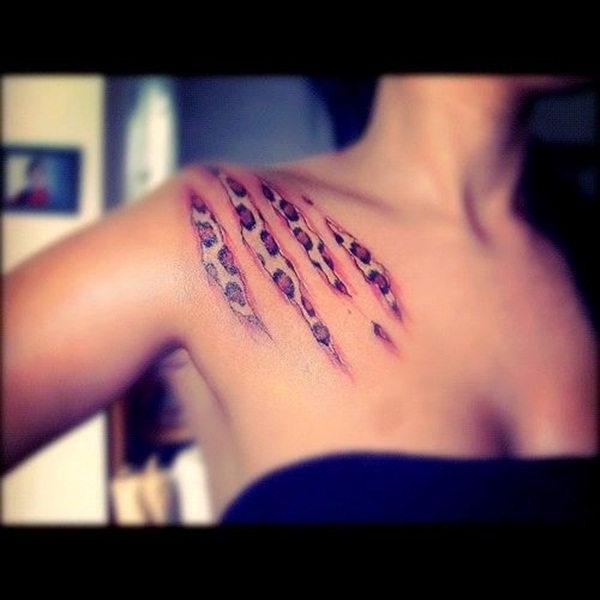 You can still display your inner animal without having an actual animal rip through your flesh in a piece of body art like seen in the image above. 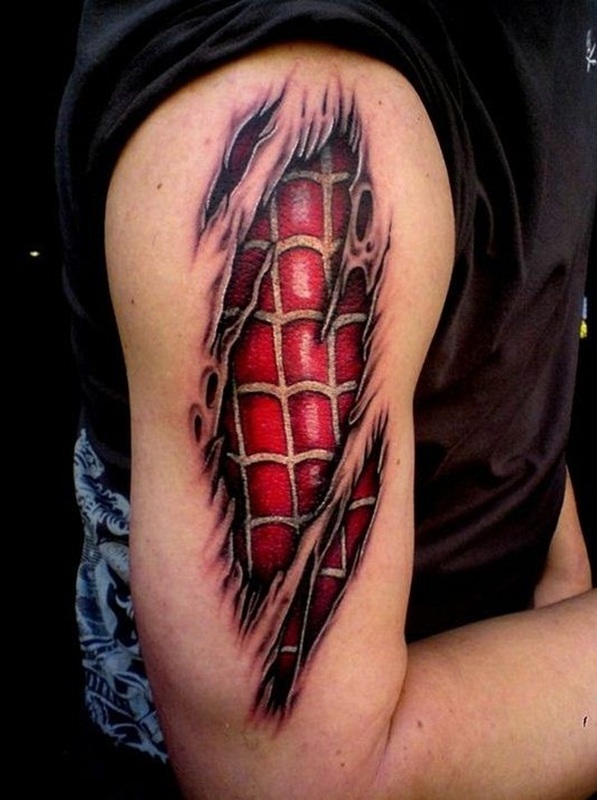 Lastly, our final piece of a piece of torn flesh displaying this guy’s true identity: Spiderman. If your flesh were “ripped open” so to speak, what would be lurking within you?